Students pose outside a Parisian café. Syracuse Abroad is hosting an information session for “Paris Noir: Literature, Art, and Contemporary Life in Diaspora,” on Wednesday, Nov. 14, at 6 p.m. in 319 Sims Hall. “Paris Noir” is a six-credit, study-abroad seminar for undergraduate and graduate students (AAS/LIT/WGS 400/600/ETS 400 and AAS/FLL/WGS 490/690/ETS 490) in Paris from June 6 to July 11, 2019. 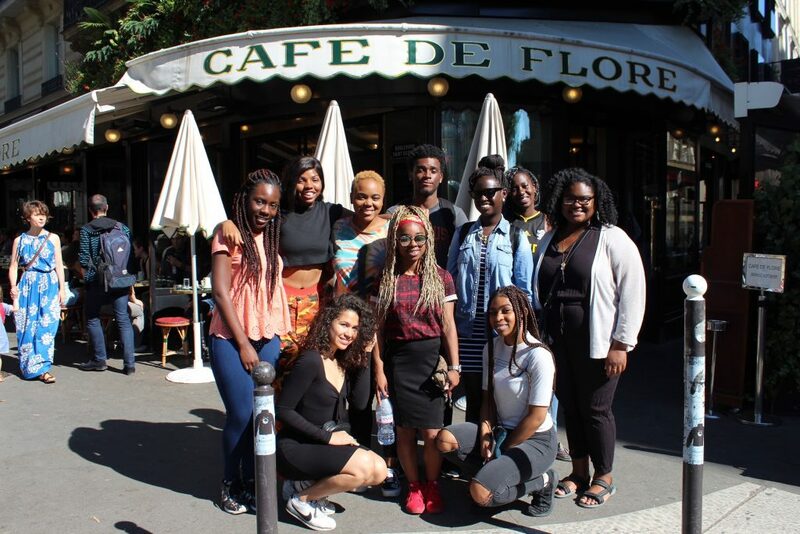 Participants will study the influence and dynamics of black culture, literature and experience in Paris, past and present. Like a jazz composition, the seminar is arranged to convey variations and diverse interpretations of the “Paris Noir” theme and features panel discussions, poetry readings and visits to community theater workshops, working artists’ studios, nightclubs, concerts, African markets and restaurants. Critical reading of literary and cultural texts, analytical thinking and lively exchange of ideas are important seminar components. Students will also enjoy impromptu meetings with legendary figures like the poet Sonia Sanchez, jazz great Archie Shepp and members of the Alvin Ailey Dance Company. Applications are due Feb. 10, 2019. Details of the seminar will be provided at the information session. Information is also available by contacting Myles Chalue at mwchalue@syr.edu or Janis Mayes at jamayes@syr.edu or by visiting suabroad.syr.edu.